I have abandoned upper slots because nothing or almost nothing gets out. 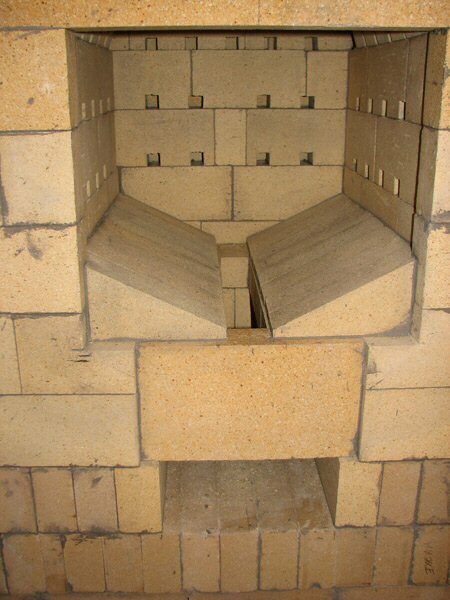 Pressure in the firebox changes from negative (created by the chimney draft), to positive as you get to higher level in the firebox due to the fact that temperature rises very rapidly and gases expand. I think it may be true for any system firebox that have reduction in size towards the exit (throat), however, some differences can be present in channel systems like contraflow and I cannot speak for them. Fireboxes in bell system do behave differently; Norbert noticed it as well when he was at my place. I guess it should be for the fact that dry joint (shortcut) relieves pressure, and kind of “relaxes” the flow. It may be different in channel system and Fetze's experience proves it. I had a conversation about secondary air supply slots with Igor one day quite a long time ago and back then he said that nothing is going to come through slots that are located high and are narrow (funnel like) in the bell system. I didn't believe him then and built a firebox with funnel-like outlets right at the throat. I tested it very simply: looked if there is draft in the air supply channel - nope, there was none. Igor was right: overpressure plus too much resistance in the air channel made it impossible for air to pass through. I then started to increase size of outlets and finally came to 1x1" outlets and also increased width of air channel to 3/4" (between two walls of the firebox). It did work. I am not afraid about too much air in the bell system as whatever is extra leaves through the dry joint and goes right for the chimney. Most of the tests that I run last winter where done on such firebox and oxygen levels were always low. During that testing, I did want to see if there is evidence that secondary air actually improves combustion, but I didn’t have time to run tests with secondary air slots closed and have no data yet. I had a chance to experiment and test different grate sizes though. Igor ran some tests in France at the same time. We came to the same conclusions: the cleanest burn was without underfire air (as Norbert told me long time ago – I also didn’t listen to him then :), but temperatures were quite lower and we both didn’t like very long coal stage. Igor believes now that a grate should take only 10% of the firebox floor. I don’t know percentage, but now I install ½ of a standard 4.5 x14” grate resulting in 2 ¼” x 14” grate dimension (only approximately half of that space is air slots – so it is quite small). I run one test with such dimension and liked it (sure, want to do more when I have time). Seems that it doesn’t have significant adverse effect, but helps to finish coals fast. So, it seemed to be working fine with several levels of secondary air slots, small grate and 1” slot in front of the firebox door (no steel deflector on top). However, I could see that almost no air at all is coming from the upper slots. I actually suspect that with high pressure, gases can actually be pushed into such large slots and actually affect air coming up the channel adversely. I started to eliminate upper rows and came to a conclusion now that they should be below 1/2 height mark. This is where I am now. Want to test all this sometime when I set up my own testing facility. 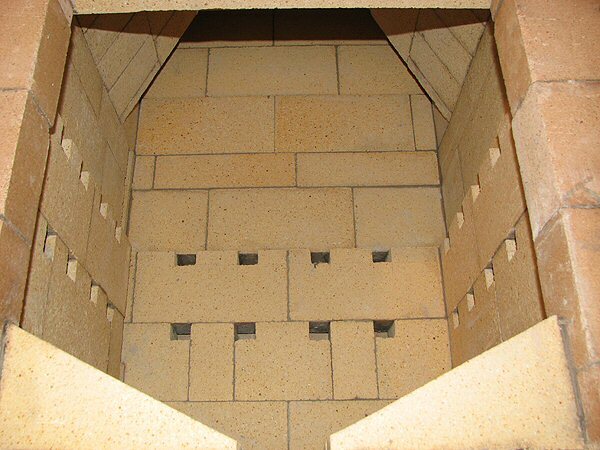 Interesting observation: our commercial sauna heaters that have secondary air supply system enjoy much longer life time of the firebrick in the firebox due to the fact that bricks are cooled by the air coming up the channel behind. Typically, sauna heaters are overfired to the point were bricks are glowing yellow, and this happens once or twice every day. In such stress, fireboxes have to be relined once in 1.5-2 years or even more often. The new style fireboxes show no signs of deterioration after 1 year. I also noticed that fireboxes with secondary air supply burn noticeably cleaner. What happens with fireboxes with no secondary air, they stay hot all the time, so every new load catches fire very fast, complete load at once resulting in air starving conditions for the first 15-20 minutes. Quite a lot of soot can be seen in the smoke at that time – literally black smoke. The new version however, doesn’t have this spike. All this considering that sauna heaters have all-grate floor for high temperature burn. 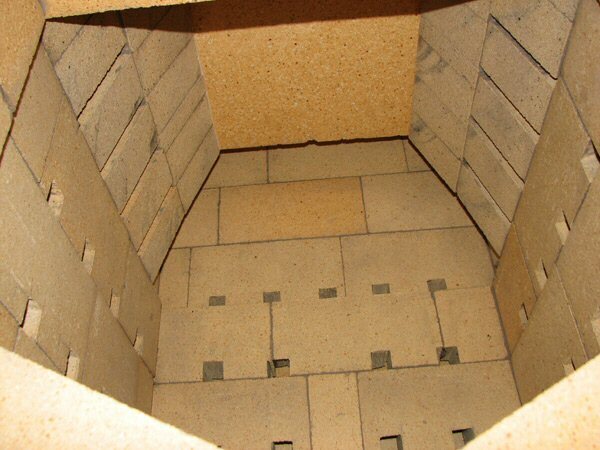 Interesting, but 18”x 40” firebox with secondary air supply (grate dimension 14x31” !) burns much cleaner that no sec, air 16x20” firebox (9 x14” grate). As for the controlled air supply, over time I turned from a believer that fire has to be tended to a believer that the less control the better it is. My latest air supply system described just above seems to be self-balancing as sizes of air supply channels determine how much air passes each direction. I just need to have air supply completely open for the whole cycle. Advantage of bell system in terms of gases stratification doesn’t allow our heaters to suffer from too much air. Ideally, I just want an airtight air supply door. Otherwise, the bell system has been ready for “no-damper” mode for a long time. I actually built one heater without shut-off damper with standard Puulampoo ash box door and Norbert’s door. The heater stays warm as long as others do, no noticeable difference. The heater we are going to build at the Wild Acres will feature this described air supply system. I am attaching four pictures: two named "Treat_Hull_firebox 1 and 2" show older version with three rows of outlets and small grate. The third one "Conway4" shows the newest version: two rows of outlets and same small grate. "Conway3" shows the complete core, you can see the grate there. Both fireboxes have bake oven above hence the finish of the top of the firebox. I completely agree with you that stacking and fuelling have enormous impact on emissions. However, I have come to realize that it is extremely difficult to teach the operator here, in North America - I find that quite a few of my customers don't even read the manual I supply them with... From now on I am giving my clients a Client Acknowledgement Form to sign. They are signing that they have received the manual and instructions and understand importance of following them. I hope it will help somewhat, but I am afraid not that much. I have come from a country with strong traditions in masonry heaters, country where people are used to follow certain firing routine and perceive it as the norm. And I used to think the same way. However, it is very different here. 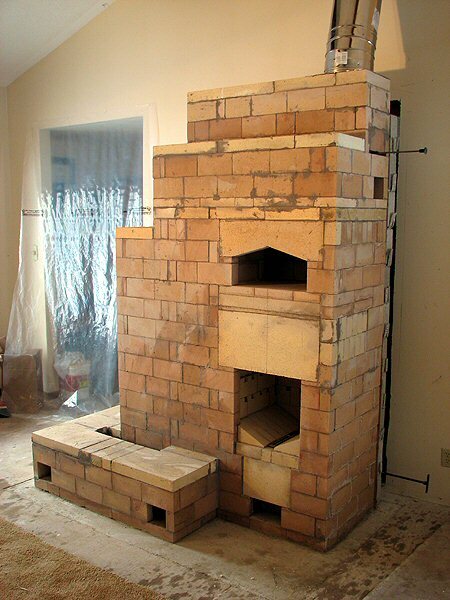 Too many people apply open fireplace firing techniques to masonry heaters either conscientiously or not simply because there is no tradition for masonry heaters. It takes centuries and generations to develop right attitude towards wood fire and firing own heating fireplace. It is very difficult to change. Having realized it, I am trying to get to the point where stacking, fuelling and spices have the least affect on emissions. It may be an ideal impossible to reach, but a good goal to me. It is interesting that many things on this road point to a very simple grundofen (no under fire air), however, we rarely install completely tight doors and therefore cannot take this approach directly. And I also don't like their never ending firing cycle. Most of the heaters I have seen in Wels ( Austrian kachelofen fair) combine grundofen firebox with some sort of secondary air supply and get between 700 and 900ppm (I've bugged every presenter for their CO data). No wonder, when CO limit in Austria is 1100ppm. Sure it is tuned for their firewood, but isn't it the same what you are doing? Try to burn spruce (as people in Alaska do) or cedar (common fuel in BC), following the same pattern as for hardwood - it will be completely different. This is another problem with trying to figure out the best stacking and fuelling pattern - it will not work with other type of firewood in other parts of country. I face the same problem as I travel a lot and build heaters in regions with different fuel available. I keep building fireboxes with secondary air supply because it seems that it helps to burn cleaner within certain range of firing techniques - allowing some variations without punishment. I have changed the layout for the secondary supply outlets, however. They are located in the lower part if the firebox (I have eliminated top rows completely) and visually perform much better than earlier versions (I think for the fact that greater negative pressure in the lower part of firebox allows more air to pass through). The outlets and air channel are bigger now as well. ( These comments are based on visual observations: I can clearly see how air coming out of outlets is interacting with flames). Unfortunately, I had no opportunity to test these variations yet, but have agreement with some of my clients to do so later. As for "best fireboxes", I understand now that it may be much easier to identify the dirtiest burn, but very difficult to find what and when is better as all these differences are located on a very thin line. I'd be glad to measure particulates if it would be much easier. I have checked your plots for correlation of opacity to Condar and it seems pretty close. What is your opinion? It is interesting that they say that CO levels were below 1000ppm while Sjang in Denmark says he gets about 350ppm in his version that has no fans and air is supplied form the top. I was expecting lower emisions from Hills furnace. Remember this was 1978. They were using an Orsat apparatus to get spot CO readings, so the precision of the measurement is unknown. 350 ppm is pretty good. I got that, as well, during some portions of some burns during this winter's testing. So, unless it is an averaged reading over a whole burn cycle, the context for the measurement needs to be known, as well - for example, over what range of fuel sizes, etc.. We had one instance for a few minutes of almost zero CO -- 20 ppm. Seems that conventional fireboxes of the best design like BIO in Europe or even just a grundofen, can be close in performance in terms of emisions. Yes, I agree. The Hill furnace might be more predictable over a wider range of fueling parameters. I see more variation from stacking and fueling parameters than from anything else. Nobody is really interested in looking at that, because it is not something you can sell. Manufacturers need to make themselves and their buyers believe that their firebox is "better" than their competitor's firebox. Nobody wants to admit that what you really need to do is to train the operator - that does not fit into the parameters of the commercial marketplace. Certainly, there is a limit to what you can do with natural draft and cordwood of various stripes. Inevitably, you are looking at a tradeoff between emissions and efficiency. Particularly if you look at CO instead of PM. Given the benefit of powered draft and powered exhaust, like the Hill furnace, you could do more in a heater. Particularly with cheap sensors and processing power available today. What a nuisance with the ties! side-ignition, and sometimes I am able to get smokeless starts. Rocket-style furnace from 1979. A lot of very valuable information. Another document about fires in compartments is also remarkable.